In keeping with the highest standards of the automotive industry, we at Dent Team utilize a process known as paintless dent repair (PDR) to remove door dings, creases, minor dents, and hail damage. 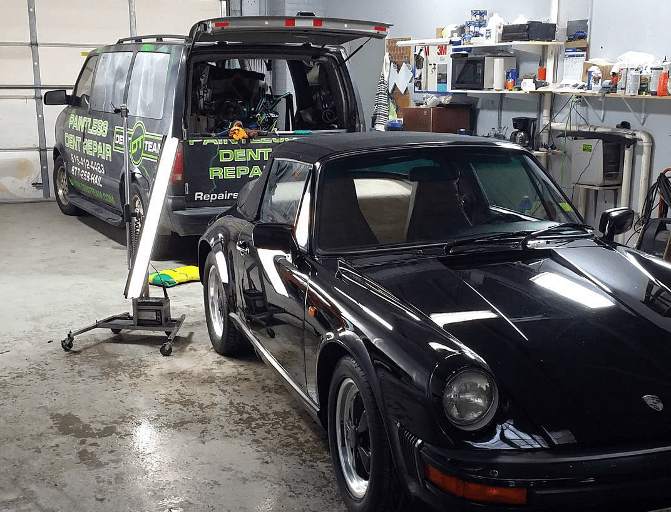 Using specialized tools and training specific to paintless dent repair, we gently repair the damaged area on a vehicle back to its original condition without repainting or using harsh chemicals while still retaining the factory finish. With experience dating back to 1991, we provide the highest quality services and repairs in the industry. No more long waits to get repairs done. Dent Team services all makes and models of automobiles. We understand that your car is an important part of daily life. Most repairs can be done in one day, allowing you to get back on the road with minimal down time. Dent Team is here to provide the finest service to you, our valued customer! No more long waits to get repairs done. No more worrying about unsightly dents and dings. Dent Team is here to provide the finest service to you and your customers. Dent Team is capable of being on site anywhere in 24-48 hours after a hail storm to evaluate damage and begin the process of repair. Whether you have 10 vehicles or 10,000, Dent Team can assemble a team of skilled technicians to meet your needs and repair your inventory with unparalleled speed and professionalism. Dent Team is able to repair inventories of all sizes quickly and efficiently. Hail storms can slow down sales and over-load the regular schedules of body shops and service departments. Dent Team can work with you and your customers to provide top-notch repairs and service to eliminate the stress often associated with this catastrophe. 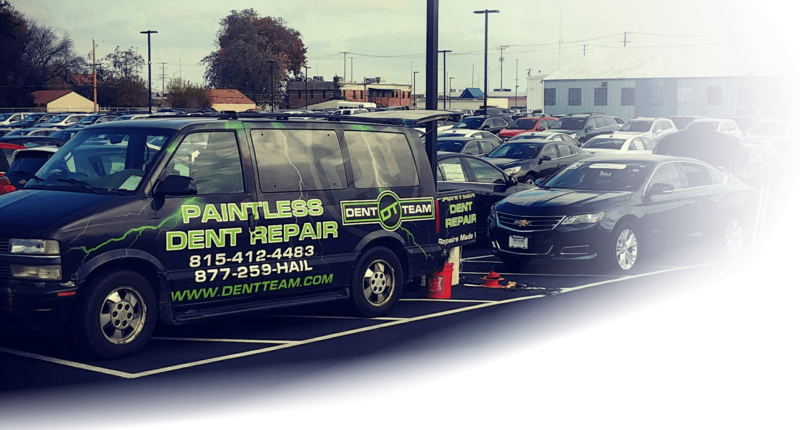 Paintless Dent Repair is the process of removing minor dents, door dings, creases, hail damage, and in some cases severely damaged panels, with the use of specially designed rods, hammers,and or glue pullers. The car maintains it's original factory finish. There is no paint, bondo, or body filler needed during the repair process. Check out Instagram to see Dent Team at work!